As with all equipment from North Pro Gas, when you make a purchase with them, you know you’re investing in a good quality item. 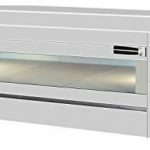 Made in Greece, but delivered throughout the UK, this electric commercial pizza oven made from high grade stainless steel is a well-priced and sensible choice for your restaurant or pizzeria. It operates with 400V-3N-AC-50Hz, has a wattage of 10200 and works with all UK and European power points – no batteries required. However, you will require a qualified electrician to carry out the installation for you (see instruction manual). This new commercial pizza oven has a fire-resistant internal plate and complies fully with the EN 60335-1 safety requirements, so you don’t have to worry about any unexpected accidents. Its dimensions are 152 x 95 x 45 cm, which translates to 11 small pizzas, 6 medium pizzas, 3 large pizzas or 2 extra-large pizzas. The oven is designed to be placed on a tabletop, so ensure that you have measured your available surface space before purchase. This electric pizza oven is very simple to use, with a basic on/off switch, standby switch, digital thermometer and thermostatic sensor. Its tough glass door and internal halogen light allows you to see inside and check how the pizzas are cooking, while keeping heat insulated – the best option for energy efficiency. A useful feature is its preheating switch, which you can flick on at the start of the day to get the oven going before your diners start placing their orders. The handle on the door is an ergonomic design created to make the oven safe and easy to open and close. While there is a one-year warranty on parts with this commercial pizza oven, it’s important to note that service is not included. But with the reputation of North Pro Gas for creating robust and well-made catering equipment, we’re confident that any restaurant or pizzeria owner would be happy with this purchase.